A huge thanks to these 15 volunteers who removed trash from the Churchill Bridge area along FM 2611 this past Sat – Co-Chairman Mike Pudlo, Barb Pudlo, Lynette Nagler, Co-Chairman Tom Ronayne, Ange Ronayne, Tim Logan, Jane Logan , Susan Bailey, Lohn Zylicz, Karen Zylicz, Fred Kanter, Cathy MacDonald, Vicki Head, Wayne Head and Kinleigh Head. Also thanks to Constable Neal Longbotham who slowed traffic in the trash collection area. Friends of the River San Bernard volunteers stand in front of a mound of 41 bags of highway litter collected on Sat Nov 14. This is in partnership with TxDOT’s Adopt-a-Highway program to pick up trash along a two-mile stretch of FM 2611 before and after the Churchill Bridge. Two other trash pickup events were held in January and June of this year. 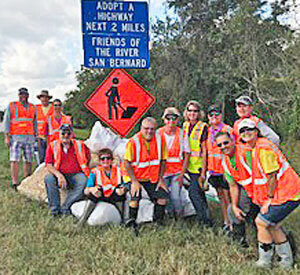 Volunteer participation sends a clear message that their efforts really do make a big difference in keeping the San Bernard looking beautiful!